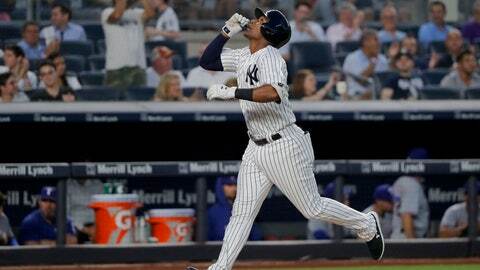 NEW YORK (AP) — Giancarlo Stanton’s teammates jumped out of the dugout, amazed at how fast the power hitter’s latest homer sped into the Yankee Stadium seats. Stanton hit the hardest homer ever measured by Major League Baseball’s Statcast system, Neil Walker hit two more home runs and New York beat the Texas Rangers 7-3 on Thursday night. Stanton’s 28th homer was measured at 121.7 mph, the fastest long ball tracked by Statcast since the system was introduced in 2015. The line drive landed a few rows into the second level of seats in left field. Hicks kicked off New York’s homer barrage after a questionable decision from Texas manager Jeff Banister. Hicks was more concerned with Stanton’s latest feat. After his bullpen got taxed during their three-game set in Chicago, Yankees manager Aaron Boone was looking for a longer outing from Haap, who had not pitched since July 29. He didn’t disappoint. Stanton hit his lined shot out to left in the fifth inning, making it the third straight game he’s homered in. Walker’s home run in the sixth made it 7-3. Hicks’ two-run homer gave him a career-high 53 RBIs. Walker’s two-homer game was New York’s 20th multi-homer game of the season, four shy of the MLB record of 24 set by the 1961 Yankees and 1966 Atlanta Braves. Yankees: C Gary Sanchez (groin) was schedule to do some running at the team’s facility in Tampa. He’s been on the disabled list since July 24 and is expected to rejoin the team at home this weekend for further evaluations. … RHP Chance Adams was demoted to Triple-A Scranton/Wilkes-Barre after Wednesday night’s game in Chicago to make room for Haap.